THEY made heavy, heavy weather of it in challenging conditions but Mick McCarthy's second tenure as Ireland manager got off to a winning start in Gibraltar. The visitors laboured through a scoreless first half that made sections of the travelling support anxious. And a brilliant save from Darren Randolph just after the restart prevented the situation from becoming even more serious. 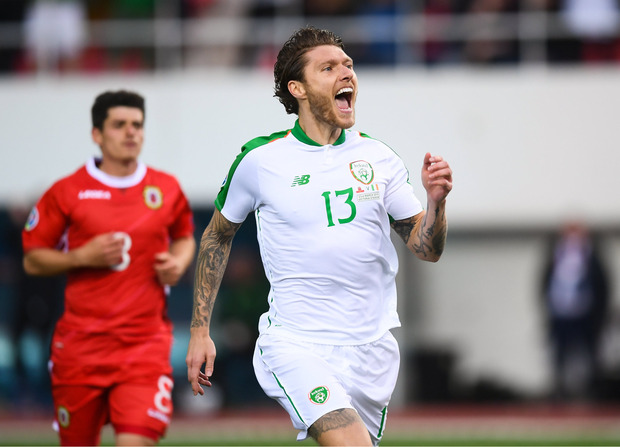 Ireland duly responded with purpose to make the breakthrough with fine play from David McGoldrick paving the way for Jeff Hendrick to convert. However, McCarthy's men were unable to press on and remove anxiety from proceedings and rode their luck when Gibraltar's Lee Casciaro - a policeman by trade - fired a shot narrowly wide of the post after a Richard Keogh error. Gibraltar didn't really threaten afterwards save for a few speculative strikes from distance, but the narrow scoreline meant there was no scope for relaxation or experimentation. McCarthy's decision to replace striker Sean Maguire with the bustling midfield presence of Harry Arter told its own story. The opening 45 minutes were hard going. Central striker Maguire was subdued as Gibraltar defended deep for spells and challenged Ireland to play through them. Seamus Coleman and Matt Doherty combined well on a a handful of occasions, but white shirts struggled to get themselves into the right positions in the penalty area. Question marks hang over using Doherty as a right winger in order to get him into the side; he was replaced by Brady early in the second half as McCarthy looked for a more natural option. Conor Hourihane's dead balls were Ireland's main threat yet a combination of stout defending and poor Irish movement ensured that a series of dangerous deliveries came to nothing. Indeed, it was an attempted clearance from a home defender that called keeper Kyle Goldwin into action. By contrast, a corner from Gibraltar just after the restart found skipper Roy Chipolina, who rose highest and forced a fine one-handed stop from Randolph. The Irish reaction was effective as Hourihane found McGoldrick, who had drifted to the left side and calmly rolled the ball across the box into Hendrick, with the Burnley player's one-touch shot finding the bottom corner. Ireland continued to huff and puff, however, and their inability to call Goldwin into action on a more regular basis was a damning reflection of their attacking play. The conditions should be more to their liking when Georgia come to the Aviva Stadium on Tuesday, but McCarthy will know that the performance level will have to improve considerably.